One of our favorite techniques for dressing up a piece of silver jewelry in the Eggtooth Originals jewelry studio is Keum boo, or “attached gold”. It is a process by which the copper alloy is removed from the surface of sterling silver, resulting in a thin layer of pure silver. The chemical properties of the pure silver lend themselves to forming a bond with nearly pure silver (23.5 karat). 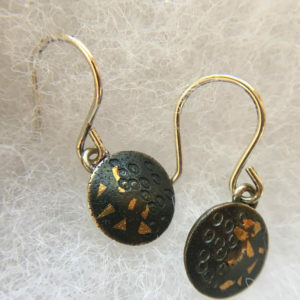 Finishing with a touch or a bunch of patina, darkens the silver and creates a lovely contrast between the two metals. Watch this video to see how the final step of attaching the gold goes down. Here are some current pieces available in our on-line shop.